Photo by Casa Rosada (Argentina Presidency of the Nation). 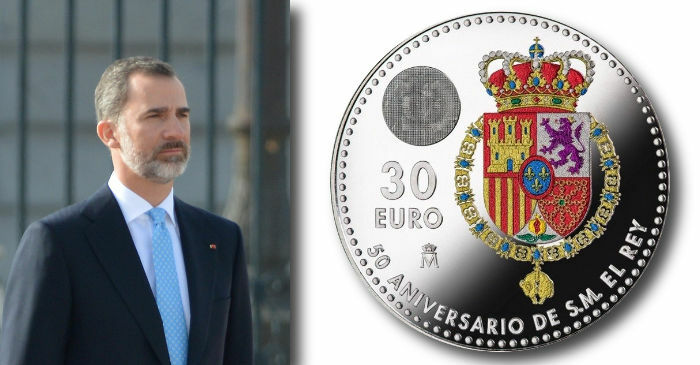 The Fabrica Nacional de Moneda y Timbre – Casa Real de la Moneda have issued (30th January) a new commemorative 30-euro silver coin which is minted in celebration of the 50th birthday of His Majesty King Felipe VI, who celebrates his special day on the same day of the coin’s official issue. King Felipe VI succeeded to the Spanish throne in June 2014 upon the abdication of his father, King Juan Carlos, who stepped down after a reign of almost 39 years. Felipe Juan Pablo Alfonso de Todos los Santos de Borbón y de Grecia was born on the 30th January 1968, in Madrid, as the third child and only son of Crown Prince Juan Carlos of Spain and Princess Sofia of Greece and Denmark. Shortly after his birth, he was styled as an infante of Spain (meaning prince), which is a title and rank given in the Iberian kingdoms — although his father was not yet king at the time of his birth. Upon the accession of Juan Carlos as king in November 1975, the young Infante Felipe was recognised as the next in line of Spanish succession, but his place would not be officially granted until 1977 when Felipe was formally created prince of Asturias — the official title of the crown prince. On the 2nd June 2014, after a reign of almost 39 years, His Majesty King Juan Carlos surprised much of the country when he announced his intention to abdicate later that month in favour of his son, the prince of Asturias — citing personal reasons. Prince Felipe became king of Spain as Felipe VI at the stroke of midnight on the 19th June and was formally sworn in and proclaimed king in an investiture held at the Cortes. King Felipe VI was married to the former Letizia Ortiz Rocasolano in 2004. They are parents to two daughters: Leonor, now the princess of Asturias, and their second daughter, Infanta Sofía. Silver Brilliant Uncirculated coin with applied colour. Hover to zoom. 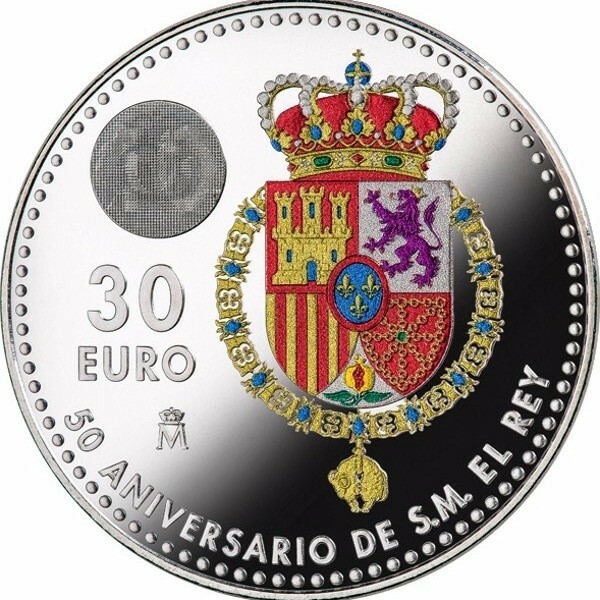 The reverse side of the coin depicts the coat of arms of His Majesty King Felipe VI, which appears with colour. Next to the shield, in the upper left part, is the quadruple latent image in which is shown the royal crown. Under this is the face value of the coin, 30 EURO, and the mint mark. Below the primary design is the inscription 50 ANNIVERSARIO DE S.M. EL REY. The vivid colour of the coin’s coat of arms is applied with tinted lacquer and utilises a sophisticated laser system, recently acquired by the Spanish Royal Mint, which guides the tinting onto the shield and generates the colours gold, red, blue, green, and purple — which is dependent on the relief of the coin. Silver Brilliant Uncirculated coin with applied colour. 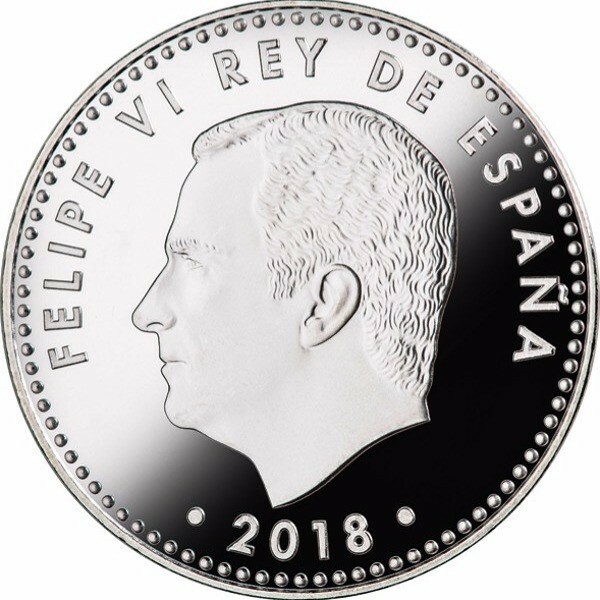 The obverse side of the coin depicts the effigy of HM King Felipe VI, along with the inscription FELIPE VI REY DE ESPANA, and the year, 2018, placed under the king’s likeness. An additional commemorative circulation coin is also being released on the same day as the silver commemorative coin. 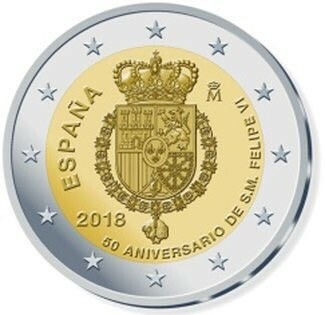 This is a bi-metallic €2 coin which includes the same celebratory design. The reverse side of the €2 coin is the same as that of the rest of the current common euro design with its face value, the European Union map, and the European stars. The silver coin is available for its face value at various points such as commercial banks and post offices.